It's a global warming sneak attack. Ever since global warming became an issue, scientists have observed how fast ice has been melting, both in the Arctic and in Antartica. Of the latter, a recent study published in Nature Communications by a team from NASA’s Jet Propulsion Laboratory now show that ice shelves are melting from beneath. Most of the ice is found on bedrocks and flows outward to the continent’s edges. These form glaciers that creep down towards the ocean, into ice shelves. These shelves are floating but remain connected to the mainland. The point where they’re no longer supported by the bedrock is called the grounding line. 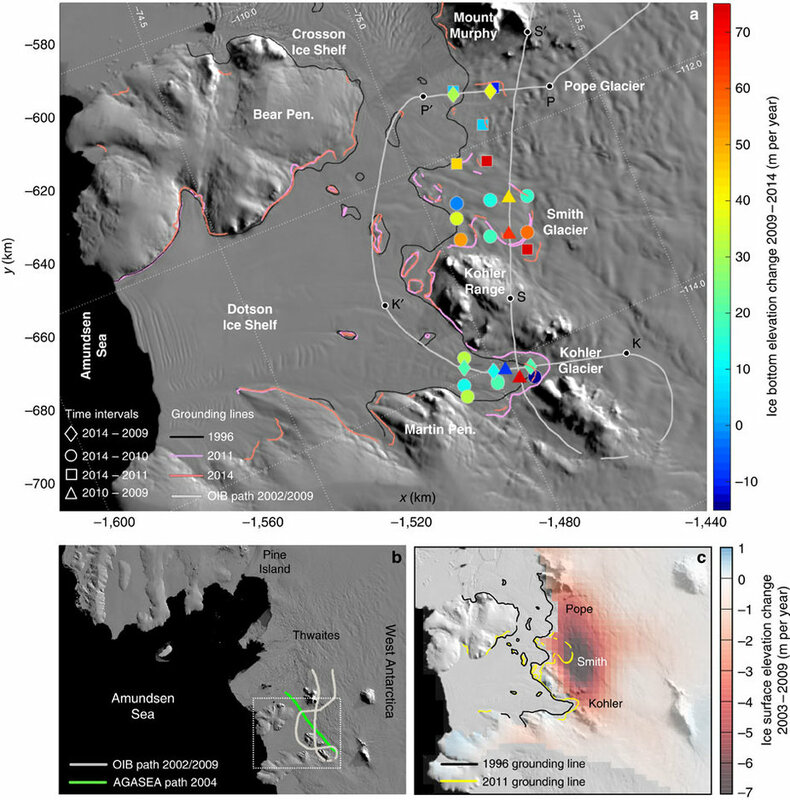 The JPL research team used radar to look the grounding line in several areas along the Western Antarctic ice sheet edges, focusing on an ice shelves known as the Amundsen Sea Embayment. They discovered that ice in these parts is melting fast from underneath, presumably due to an increase in warm water circulation. Th submarine ice (ice found underneath actual shelves or sheets) are melting at a rate “much higher than steady-state levels, removing 300–490 m (984 – 1608 ft) of solid ice between 2002 and 2009 beneath the retreating [Antarctic] Smith Glacier,” the study reports. Credits: NASA JPL/Khazendar, et al. While recent studies show that the influx of warm water under the ice shelves have stalled — and there are signs last year that Antartica is gaining more ice — there’s no reason for us to keep our guard down. The obvious culprit behind the melting ice is global warming. Fortunately, there are a number of efforts in place to combat global warming, the most notable of which is the Montreal Protocol. Still, this is just a start. Neglecting the see the melting ice as clear evidence of global warming will do more harm than good. In the case of the Antarctic ice shelves, the more the submarine ice melts, more ice is exposed to warm water. “It becomes a runaway process, which makes it unstable,” notes geophysicist Ala Khazendar, polar expert at NASA JPL. Furthermore, the melting process seems to be irreversible. What happens when Antartica’s glaciers flow into the sea? “The simple answer is we don’t know. And that’s the scary part,” warns Khazendar.